I admit, I’m one of the crazy people who LOVE shopping on Black Friday. I’ve actively shopped that fateful day for over 10 years now. Perhaps the thrill of the hunt, the massive savings or the challenge to buy that hard to get item pulls me back every year. While staring at numerous Black Friday ads for hours creating my game plan, I commented to my boyfriend that only certain people can really attempt and survive Black Friday. They have to own a “particular set of skills” (thank you actor Liam Neeson). As I named the characteristics, he thoughtfully said, “It sounds like the same skills you need in life”. Exactly. Shopping Black Friday is about goals. You can buy a TV any day of the week, in your pajamas, at home, online. But to get that same TV for $299 within a tiny window of time — now you have a challenge. Whether you want to be successful in life or nab that last cheap iPod, the same skills apply. ENERGY – If you’re going to shop at 2am with thousands of other sleep deprived people, you’ll need energy. While waiting outside your favorite store, you’ll see loads of people drinking coffee, doing jumping jacks or chattering quickly to keep themselves coherent. They have energy because their goal lies within the doors of that department store and they’ll do anything to stay awake to get it. Do you have that same energy for your life? Proper sleep, eating right and good mental well-being are essential to stay on track for your goals. Years ago, I read an article in Inc. magazine. A CEO mentioned energy being the #1 component to success. Years later, I realized if you don’t have energy to pursue success, you’ve got a tough road ahead of you. Energetic people are successful people. PERSISTENCE – This is defined as “firm or obstinate continuance in a course of action in spite of difficulty or opposition”. This describes the epitome of Black Friday. Heavy traffic, no parking, irritable shoppers, crowded stores, waiting hours in line and praying your item isn’t sold out. Shoppers endure great obstacles to save a great deal of money on that prized Blu-ray player. Those who choose not to go through a few road bumps, don’t get the reward. It’s that simple in life. Pursuing something truly worthy in life means pushing through obstacles, naysayers, tragedies and setbacks. There’s nothing convenient about Black Friday, just like there will never be a perfect, convenient time to pursue success. Push through the negativity and keep your eye on the prize. PATIENCE – This may be the top tactic needed to get through Black Friday. Once you leave your house, you may have to wait to find a parking spot, wait in line to get in the store and wait in the check-out line an hour, or two. If you lack patience, these rituals will make your brain explode. The quote “All good things come to those who wait” runs through my mind while standing in Kohl’s in wall-to-wall people at 2:30am with a few items in hand. It’s normal to want success overnight, but the reality is, it just doesn’t happen. If you maintain your focus, keep doing the right things and have faith you’ll succeed, your patience will be rewarded in victory. Take a deep breath and know you have good things coming. ATTITUDE – While navigating through seas of people and aisles, not everyone is in a sunshiny mood at 3:30am. You may even see media horror stories about the experiences of Black Friday. While some may be true, I’ve shopped Black Friday in multiple states and cities and manage to have a positive experience every time. Why is that? Because I’m expecting to have some road bumps in my shopping extravaganza. Then, I keep my eyes fixated on my goal and maintain a positive attitude toward my success. When you’re running for a better life, your attitude will be the difference maker on the level of your success. Bring a negative attitude and life will feel miserable. Bring a good one and suddenly doors of opportunity swing open. ORGANIZATION – This is essential for a successful shopping trip. Creating a solid game plan of scoping out ads ahead of time, making a list and setting a budget will get you through Black Friday. Pick a few hard to get items and go after those first. As in life, if you have no clue how you’re going to obtain your goal, your chances of achieving success are pretty grim. Don’t be afraid to create a timeline or prioritize a list of steps on how you’ll achieve your goals. Reading books, mentoring with experts and picturing your success aren’t bad routes to follow either. Put your dreams in reachable perspective by organizing your thoughts. There you have it — life according to Black Friday. If you venture out for these elusive deals, may your car find close parking spots, may you get the last cheap iPhone and may you find a new friend while waiting in line. If you can endure all these challenges for one day of shopping, imagine what can be accomplished by applying these same characteristics in your life. Nothing compares to the feeling of realizing your dream and going through many harsh struggles to finally taste that long-awaited victory. It’s always worth it. 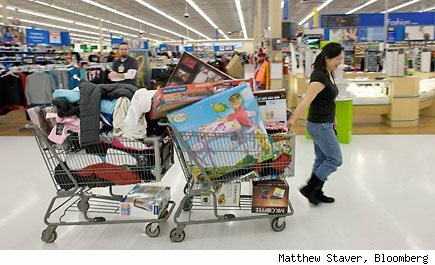 Note: It’s true, thousands of people opt to do much of their Black Friday shopping online to avoid the insanity. I too, have done this, but where’s the challenge in that?